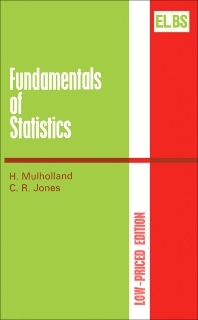 Fundamentals of Statistics covers topics on the introduction, fundamentals, and science of statistics. The book discusses the collection, organization and representation of numerical data; elementary probability; the binomial Poisson distributions; and the measures of central tendency. The text describes measures of dispersion for measuring the spread of a distribution; continuous distributions for measuring on a continuous scale; the properties and use of normal distribution; and tests involving the normal or student's ‘t’ distributions. The use of control charts for sample means; the ranges and fraction defective; the chi-squared distribution; the F distribution; and the bivariate distributions are also considered. The book deals with the idea of mathematical expectation and its relationship with mean, variance, and covariance, as well as weighted averages, death rates, and time series. Students studying for advanced level education or higher national certificates in Mechanical or Electrical Engineering, Mathematics, Chemistry, Biology, or Pharmacy, as well as university students taking such courses will find the book invaluable.